I made this quilt in less than a week. It’s very simple, but I kind of love it. 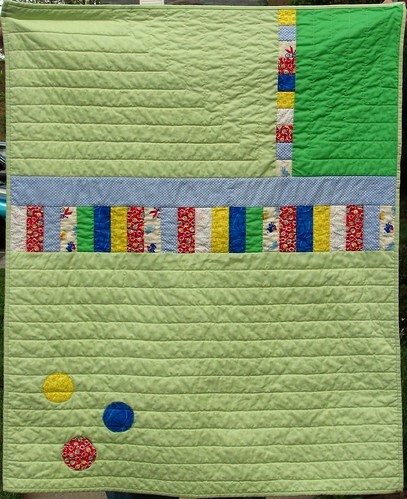 I love the bright cheery fabrics, and I love green, and I love the circles. But mostly, I love that I actually got it done. Some friends of mine recently had their third baby (a boy) and since I had made quilts for their first two children, I couldn’t neglect the third. I needed to make something fast since I was short on time and still need to finish a big project (I’m nearing the finish line on that one!). This was a great quilt because I didn’t plan much out in advance and didn’t need to worry about measurements very much. I may be making a lot more like this in the near future! 3 Responses to Baby Quilt! I love this quilt. It has such energy and flow. The colors work really well together. That’s one lucky kid. 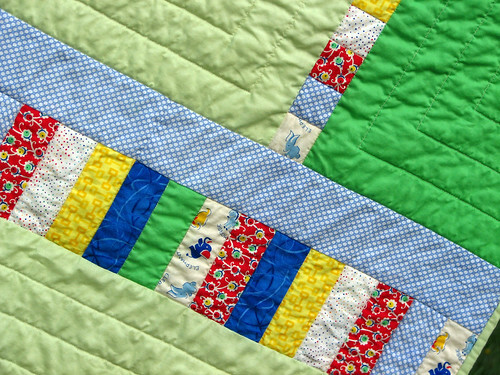 I love this quilt and the way your quilted it adds a whole new level. Wow, this design is fabulous!